Phipps Conservatory and Botanical Gardens is located in Pittsburgh. This Victorian greenhouse made from glass and steel is situated in Schenley Park, one the Pittsburgh's largest greenspaces. The site was given to the city as gift in 1893 by Henry W. Phipps. His desire was to build something that not only was a place to learn, but also a place people could enjoy. Phipps Conservatory promotes leading-edge green-building practices and sustainability in gardening, and incorporates these practices throughout the conservatory and gardens. The Palm Court displays an array of palm species in a room inspired by the Victorian era. The room also serves as an entryway to the many other indoor gardens. Displays of Dale Chihuly's glass works can be found among the various palms, as well. Situated inside of the Welcome Center's dome is the Sustainable Perennial Garden. The garden showcases a beautiful eco-friendly garden. The plants here require only a small amount of water was established in the ground. They also require no use of pesticides and minimal fertilizer. The Serpentine Room winds its way through the original glasshouse's west wing. The plants in this room vary by season for special exhibits and shows. Visitors can follow the brick-walled walkway as they stroll by colorful plants beds. Colorful plants can also be seen hanging from the ceiling. The Stove Room features a variety of plants from the deep tropics that fill the room with bright colors and pleasant aromas. 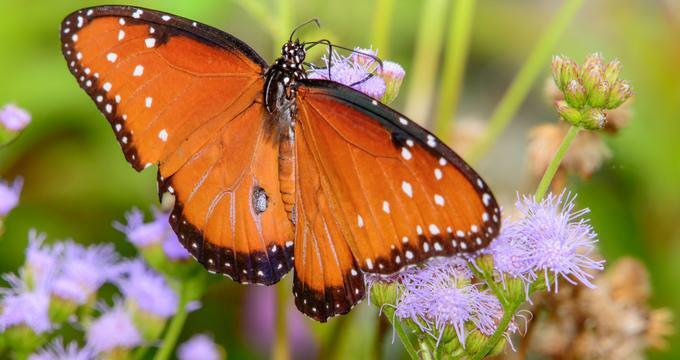 From spring until the fall, visitors can enjoy the colorful sights of the Butterfly Forest in the Stove Room. The Butterfly Forest showcases the fragile life of butterflies, one of the most important pollinators in nature. You can find the Zebra Longwings with their yellow and black stripes, the Western Pennsylvania Monarchs, as well as several other species. Some of the most archaicand oldest plant species on Earth can be seen in the Fern Room. The most prominent plant species in the room represent the Triassic Era which is the first of the dinosaur eras. There an assortment of unique plants, such as tree ferns and cycads and tree ferns. The Orchid Room features many exotic species of orchids, of which the site of will simply take your breath away. One of the major collections of orchids here is the Barbara Tisherman Slipper Orchid Collection. This collection was curated with the help of the Orchid Society of Western Pennsylvania for the purpose of being one of the most conclusive Slipper Orchid collections in the world. In addition to this orchid collection, the room also showcases miniature orchids and the Phalaenopsis Frank Sarris Orchid, dedicated to Pittsburgh's Sarris Candies' founder. The Outdoor Garden is actually a number of small gardens displaying different plant collections. These gardens are connected by winding walkways with leaf-covered benches and fountains strewn throughout. Visitors can enjoy the views of both the beautiful plants and Pittsburgh's Oakland neighborhood in this serene setting. Among the many different plants and gardens are perennials, ferns, a medicinal garden, dwarf conifers, and an herb garden. Phipps Conservatory and Botanical Gardens also has plenty of activities for children to enjoy. The Children's Discovery Garden has many interactive activities for kids such as a sensory garden, bog garden, gardens to attract butterflies and birds, and an enormous tree stump on which children can climb to their heart's content. The Japanese Courtyard Garden, designed by HoichiKurisuin 1991, blends two significant Japanese art forms: Bonsai and the Japanese garden. Bonsai art is the miniature representation of trees and landscapes, while the Japanese garden seeks to make a manmade landscape look natural. These two art forms are rarely showcased together in Japan, but here they are both harmonized and contrasted, making this a very unique exhibit. The Sunken Garden features sunken plant beds, suspended flower baskets, and fountains. The plants comprising this garden change seasonally with every flower show. The constantly changing East Room features creative, picturesque scenes with calming streams flowing by, seasonal flower themes, and cascading waterfalls. The Victoria Room the beautiful architecture of the conservatory's historic glasshouse. The large pond in the center of the room reflects the glass dome and the colors from the floral displays. Visitors can delight in creating their own water and light show by controlling the lights and jets of the pond's interactive fountain. The Broderie Room is inspired by the formal gardens of a French chateaux as seen inthe time of Louis XIV's reign. The room is also known as the Panterre de Broderie, meaning “embroidery of earth,” and is a sought after spot for small weddings and photo sessions. Plants that thrive in arid, desert climates are the highlight of the Desert Room. An array of plants species found in the southwest region of the United States, northern Mexican, and Africa are on display for guests to delight in the vivid flower blooms of these resilient plants. Hanging from the ceiling is adazzling glass chandelier created by Dale Chuhily, known as the Desert Gold Star. The Aquatic Gardens, located just outside of the Victoria Room, are only open only during the summer. The two large pools are full of tropical and hardy water plants. Flowers float on the water giving the gardens a peaceful setting. Also among the pools and plants is a statue if the Roman god of the sea, Neptune. The Gallery Room's features are designed more for kids, being that it is used often for children's educational activities. There are Discovery Tables where children can learn with interactive exploration. One of the various activities here is the make-believe farmers market where children learn about healthy food while they play. The aroma of the Tropical Fruit and Spice Room comes from the array of sub-tropical and tropical fruits, spices, and nutsfound across the globe that make up this lush garden. Among these include citrus fruits, allspice, cinnamon, coffee, bananas, and papayas The central marble basin showcases a stunningceladon and purple glass sculpture created by Dale Chuhily. The South Conservatory typically is the main focus of Phipps Conservatory'sflower shows each season. However, during the fall and winter, the South Conservatory features the Garden Railroad. During this time, visitors can enjoy the sight of miniature trains winding their way along the tracks through the exhibit's hills and valleys. The exhibit in the Tropical Forest Conservatory changes to represent a different region of the world every three years. The exhibit is multi-level and features winding pathways through tropical forest flora, rushing waterfalls, educational stations, and a fish pond. Currently, the Tropical Forest Conservatory's exhibit is the Tropical Forest Congo. Years of work researching Africa's biodiversity helped to create this exhibit. Horticulturist from Phipps visited Cameroon's most beautiful natural areas and spent time with the indigenous peoples to get inspiration for the garden. Among the many unique plants that make up the Tropical Forest Congo are the Sausage Trees. The trees are commonly known for the aromatic red flowers that producehuge tubular fruits. These fruits are by no means lightweight, with some weighing almost 22 pounds. Another featured plant is the Napoleon Hat Plant, a plant that produces passion flower-like blooms on its trunk. There are also many educational aspects to the garden, including several field research kiosks, regional food markets, and a forest dwelling. The Rooftop Edible Garden at Phipps Conservatory and Botanical Gardens is created to provide inspiration for guests' home gardens. The garden features various fruits, herbs, and vegetables. It also serves as a food resource for Cafe Phipps on site. Youth programs and children's camps also use the garden for hands-on learning. The Mediterranean garden just outside of Botany Hall is a relaxing place for guests, complete with trickling fountains, walkways, and benches. One of the greenest buildings on the planet, the Center for Sustainable Landscapes is a model for innovators around the world. The center recycles all of the water captured on site, in addition to generating all of the energy the center uses. Interactive kiosks and informational signs lead visitors through the inner workings of the center. The Center for Sustainable Landscapes Green Roof showcases medicinal and edible plants indigenousto the area, found within 200 miles of Phipps Conservatory and Botanical Gardens. The Green Roof serves to provide inspiration to visitors for their home gardens, as well as to provide knowledge about local plant species. Visitors will find plants, a lagoon, and a fountain as they stroll the boardwalk of the Center for Sustainable Landscapes Environs, one greenest manmade landscapes inthe world. It's the first project to ever receive the Four Stars Sustainable Sites Initiative™ (SITES™) certification. The SEED Classroom was introduced in 2015 and it one of the first sustainable modular classrooms in the country. The room produces all of its own energy, uses non-toxic materials, and reuses water on site. The SEED Classroom is one of only two of this kind of classroom in the United States. It shows how classrooms can be built in the future to boost student wellness and potential.